MINNEAPOLIS – Jan. 29, 2013 – Cargill announced that the demonstrated enhanced thermal capabilities of its Envirotemp™ FR3™ renewable (natural ester) dielectric fluid, which is made from vegetable oil, have been published within a new design standard by the Institute of Electrical and Electronics Engineers (IEEE). This validates the use of FR3 fluid in high-temperature insulation systems and operating at elevated temperatures for new and existing transformers and enables improvements in transformer size, safety, and cost. Industry-standard temperature limits for electrical transformers are traditionally capped at 110-degrees Celsius. IEEE’s new standard (C57.154™) sets the upper operating temperature limit of transformers designed with natural esters (FR3 fluid) at 130-degrees Celsius without adversely impacting transformer life. Compared to mineral oil, FR3 fluid enables transformers to last longer, better manage temperature during peak energy demand periods, and be built in a more compact design. FR3 fluid features and specifications are detailed in its product data sheet. Cargill purchased the Envirotemp FR3 dielectric fluid business and obtained an exclusive license to all applicable patents from Cooper Power Systems in June 2012. Cargill’s Industrial Oils & Lubricants business manufactures the industry leading fluid and other specialty K-class ester fluids used in a wide range of transformers and other electrical applications. These products uniquely position Cargill to provide customers with products that improve performance and enhance fire and environmental safety. The company has manufactured the Envirotemp™ 200 and FR3 brands since 2004. 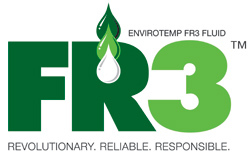 A revolutionary product released to the market in 1998, Envirotemp FR3 fluid quickly gained global acceptance and is recognized by the National Electrical Code®, FM Global, and Underwriters Laboratories. In 2008, FR3 fluid was approved and listed for the United States Department of Agriculture BioPreferred® program. In 2011, the Federal Energy Regulatory Commission approved FR3 fluid for Capital Treatment, allowing public utilities to capitalize all costs incurred to retrofill a transformer with the bio-based dielectric coolant. As a result, demand for FR3 fluid has increased, and there are currently more than 500,000 transformers filled with FR3 fluid on six continents. Cargill Industrial Oils & Lubricants is the largest Business Unit within Cargill that is exclusively focused on providing bio-based solutions to industrial markets, including dielectric fluid, paints, inks and coatings, lubricants, construction& oilfield chemicals, consumer products, flexible foam & other diverse applications in the chemical industry. Our strategy is to drive growth in sustainable vegetable-based products by delivering innovative customer solutions through a customer-focused approach. www.cargill.com/industrial-oils / www.cargill.com/fr3fluid. National Electrical Code® are registered trademarks of the National Fire Protection Association.